I don’t know about you, but over the years I’ve collected quite the amount of clarinet and music-related paraphernalia. I’m sure every musician knows the struggle of accumulating years’ worth of random music, accessories, and other tchotchkes. I used to throw it all in boxes and drawers while suppressing my inner neat freak, but then I turned to Pinterest. I love admiring the artsy snapshots of other people’s DIY organized, fashionable, and life-hacked existences. Not so surprisingly, there was very little tailored to classical musicians on Pinterest. Below, I’ve adapted several Pinteresting ideas to help musicians turn 2016 into the most organized and productive year ever. After all, time spent searching through unorganized messes is time you could be practicing! Use a glass apothecary jar for old reeds. 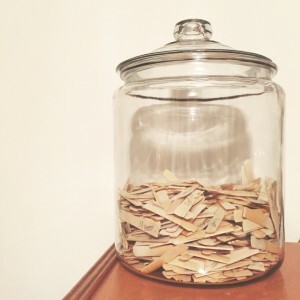 I may be a neat freak, but I have a few hoarder tendencies – I’ve saved every reed I’ve ever used. (You’re probably laughing now, but you’ll be jealous when I have kindling for a fire if there’s an apocalypse!). I bought a glass apothecary jar from Wal-Mart to store my old reeds, and it’s become a quirky display in my practice room. I also have another apothecary jar for name tags and badges from conventions, conferences, and festivals. Use jewelry organizers to store barrels and ligatures. I found a velvet jewelry organizer for $7 at Ross that is the perfect dimensions for my barrels. These jewelry organizers have compartments in several different sizes and configurations, so you can also use them to hold ligatures. Velvet ring holders for ligatures or mouthpieces. Perfect to show off a nice equipment collection. You can even make a DIY pegboard for mouthpieces, ligatures, or barrels if you’re up for the challenge. Tool box or tackle kit for repair tools and smaller accessories. I found a caddy at a Goodwill that has several compartments perfect for cigarette paper, cork grease, swabs, and other miscellaneous accessories. 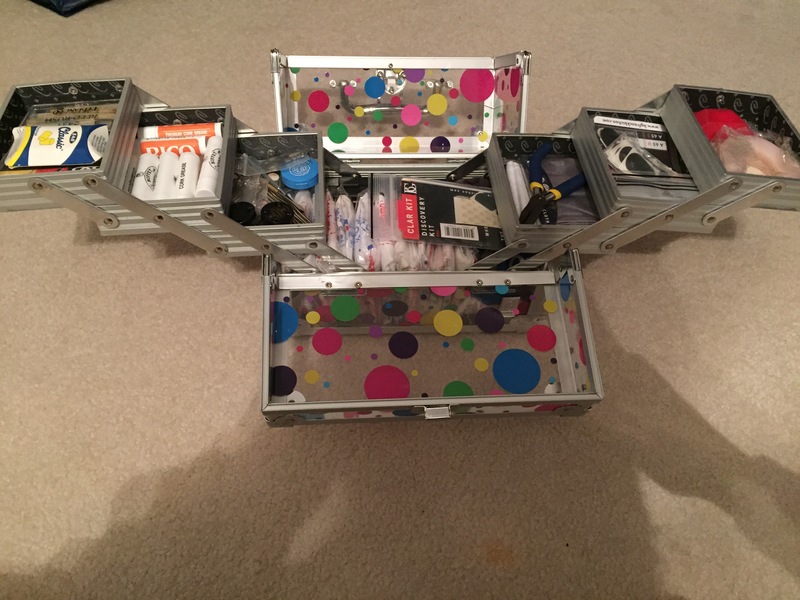 Acrylic makeup organizers are also good to divide and organize accessories like cork grease, swabs, and cigarette paper. Over the door shoe holder for accessories. 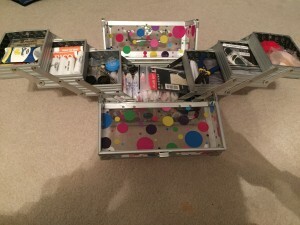 This has more compartments and space than a tackle box, and like items can easily be grouped together and labeled. 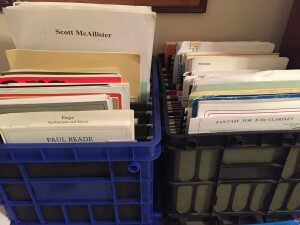 Portable file crates for easy music organization. Until I stop moving around the world and settle down, I can’t get the filing system and cabinets I’d like. In the meantime, after a quick trip to Office Depot and $10 worth of plastic portable file crates and hanging dividers, my music is categorized and easily portable. This is perfect for music students on the go to transport large music collections. These crates are also great to organize programs from all your concerts, recitals, and performances. I organize mine chronologically by year, but you can catalogue by type of ensemble or other category. Use a spinning spice rack with clear spice holders for small items, such as pads, corks, screws, or anything else that will fit. This is perfect for repair technicians who accumulate lots of tiny bits and pieces. Altoids tins (or fancy tea tins) can hold a few individual reed sleeves or other smaller objects. Go the DIY route and make a clarinet kit with extra cigarette paper, cork grease, thumb cushions, mouthpiece patches, and anything else you might need. Ticket stub memory boxes. This is a brilliant idea to store ticket stubs from the countless concerts you have probably attended. Search Pinterest for several DIY versions. Hack an Ikea Bekväm spice rack into storage for unopened boxes of reeds. Depending on how creative you get, this can double as wall art as well. Now you can finally show off your unopened box of Morre reeds. I’d love to hear from you if you have any other creative storage solutions for music and other related items! Stay tuned (pun intended) for more ideas to make 2016 your most musically rewarding yet!